Recruiting for Good empowers women by rewarding referrals with funding for Moo Moo Musica's transformation and travel to share with family and friends. 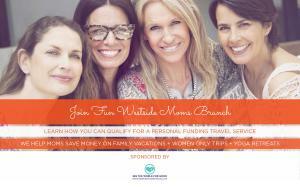 SANTA MONICA, CA, UNITED STATES, February 12, 2019 /EINPresswire.com/ -- Recruiting for Good1 based in Santa Monica works collaboratively with women to connect to companies hiring professional staff; and will generate proceeds to help fund Moo Moo Musica, and reward travel. 1. Women participate by making introductions to executives (at companies) hiring professional staff (accounting, finance, engineering, HR, information technology, marketing, and sales). 2. When Recruiting for Good successfully places a fulltime hire with the company and earns a finder's fee, it is shared. 3. To help fund Moo Moo Musica, and to reward fun travel. Carlos Cymerman adds, "Women can use recruiting for good to help JulieAnne realize her purpose, and enjoy rewarding travel; family cruises to Alaska, vacations to Hawaii or Mexico, or yoga retreats." Email Carlos@RecruitingforGood.com to RSVP for fun sponsored brunch, we meet first Sunday of every month in Santa Monica. Discuss how recruiting for good works, and answer questions (can't make the brunch email JulieAnne to make special arrangements). Moo Moo Musica was created in 2002 by JulieAnne Searles, MFT, a licensed psychotherapist, an accomplished musician, a devoted wife and mother who lives in Venice, California with her husband, Monty, and their son, Jasper. The popular multicultural music and movement program was inspired by JulieAnne’s childhood memories of family gatherings filled with singing and playing musical instruments as well as her professional therapeutic work with children and parents. It is also infused with her deep commitment to caring for and repairing our planet. Through her more than 20 years’ experience as a psychotherapist, JulieAnne recognized how crucial positive early attachment and bonding experiences between infants and parents are to healthy childhood development, and in fact, a healthy and functional adulthood. Singing, playing, modeling and mirroring experiences between parent and child as well as group interaction from a very early age help foster happy, secure individuals.